these are not my mods, I am not a modder. I am looking for old Morrowind mods in the web,and here I upload what I found interesting to my taste. You know the Silt Strider pilot Darvame, the poor thing always standing on his duty? Now she owns his nice deserved house, a place to sleep and live, near Silt Strider. The house fits well into picture of the city, placed where it would less likely too conflict with something. "﻿﻿This house was meant to fill a hole in the practically barren landscape but the new version can be taken by a player character for the period that he spends in Seyda Neen. Darvame Hleran is the silt strider opperator and it seem's she didn't own a house of her own so I gave her one." "This is a totally useless MOD for all those in need of some good drinking-company in Morrowind. 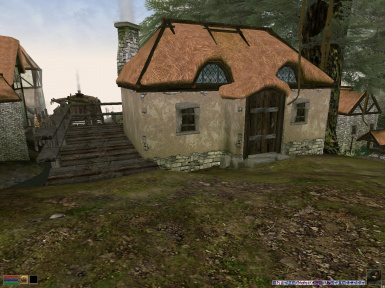 The Alcoholics Guild MOD adds a small house right outside Seyda Neen where a bunch of friendly alcoholics hang out. Just ask around in Seyda Neen, the house is not too hard to find. There are no missions or quests in the guild, no, it's all useless." Adds a house with quest down the siltstrider hill. Haven't played it yet so cant give feedback. Non compatible with "The Real Point Tavern" Mod! is a strange and mysterious man who needs your help. Will you give it to him? No? That's some attitude you've got there. You may find that there are some surprises in store...."